The scene is set with an overview of the respective states of the RAF and Japanese Air Force, and an explanation of how the American Volunteer Group (The Flying Tigers) came to be in China. There is a concise description of air ops covering the Japanese invasion of Indo China, Malaya and Singapore, together with a close study of the sinking of the Prince of Wales and Repulse, which altered the air/sea power equation. 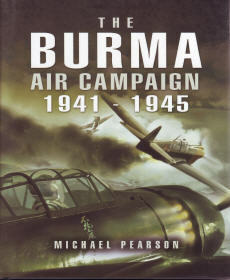 The main emphasis is on the use of air power both offensive, defensive and air transport during the protracted Burma Campaign. This embraces operations in the Arakan and the various Chindit long range penetration expeditions. These relied almost totally on air supply and evacuation. In the later stages of the War, the US and RAF combined forces and predictably this was not without controversy. Few realize that US B29s operating from India attacked Japan itself. Finally the role of ground attack aircraft against the retreating Japs played a significant part in the Allied advance in Burma. 194 pgs, HB w/dust jacket, 6.5 x 9.5, photos.